SOMME: Looking from an old crater on the north side of Hill 60, over the shell pitted ground. 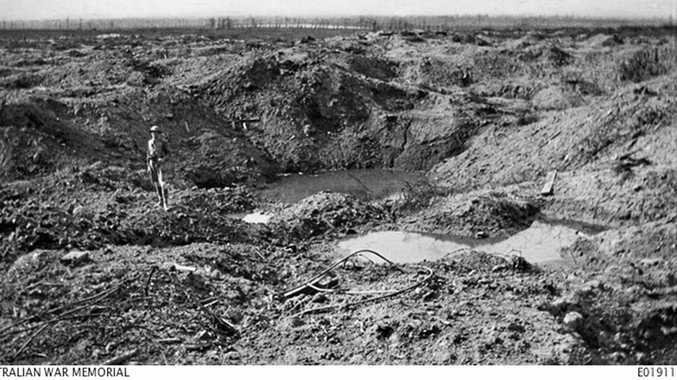 Photo Courtesy the Australian War Memorial. The underground city below Naours in northern France is a three-kilometre complex of caves and tunnels that was excavated nearly 2000 years ago. The immense underground galleries were originally former quarries and have been used by villagers since the time of the Romans to shelter from marauding armies. During WW1 Australian soldiers on leave from the Somme battlefield used the caves for recreation. One soldier had recorded that the caves contained approximately 300 rooms with one being at least half a mile long which could house up to 20,000 troops including horses and artillery. French and Australian researchers are collecting and collating the signatures with the names and biographies of the soldiers who left their names behind. To find out more about the caves and the research visit the Sir John Monash Centre Australian National Memorial France website or The Underground City of Naours site.